Editor’s note: It was tough to choose a headline for this post. Very tempting to use one of the best palindromes ever: A Man, A Plan, A Canal, Panama! So for us, the canal wasn’t just a really cool thing we did. It meant that, well, WE FREAKING MADE IT! We took ourselves and our boat safely almost 4,500 miles down the Pacific coast. We planned and prepared, we solved problems, we communicated, we faced our own challenges, and we made it. For us, the canal also means we want to keep cruising (because we didn’t turn around! ), living in our floating home and exploring new shores. And we still like each other! Of course, the canal is also pretty mind-blowing—over the course of 40 miles, we left one ocean and entered an entirely new one. All thanks to this 100-year-old man-made wonder. Fascinated by the history of it all, John and I both read The Path Between the Seas by David McCullough. Admittedly, I did not realize how long the book was when I agreed to read it. But it was still a page-turner, and it gave us a much deeper appreciation for our experience in the canal. We also visited the the Panama Canal Museum in Panama City, where we picked up where the book left off and brought ourselves up to speed on the canal’s recent history—up to the present day. The French were the first to attempt to build the canal—twice actually. They started around 1880, and finally abandoned their second attempt around 1894. Both times the effort was led by Ferdinand de Lesseps (yes, as in former-Countess Luann from Real Housewives!). He basically had no clue what he was up against and made all the wrong decisions: didn’t raise enough money, over-relied on contract workers, didn’t address yellow fever and malaria, which took tens of thousands of lives, and was convinced that the canal could be made at sea level (as in, without locks) even though the geography of the isthmus and insane tidal variations in the Pacific made that completely unrealistic. Meanwhile, the U.S. had decided to build a canal in Nicaragua. But after lots of politicking, the U.S. agreed to buy the French assets and resume work in Panama. However, the Colombian government was not cooperating with the U.S. conditions for the purchase and rights over the canal zone. So, to finish off the deal, the U.S. engineered Panama’s independence from Colombia. Most of the work and challenge in building the canal was the excavating. The canal was dug through a dense jungle at hundreds of feet above sea level, and Panama’s incredible rains made the terrain even more challenging. At the height of the project, 45,000 people were employed, more than half of whom came from various Caribbean islands to work on the canal. When the U.S. took over building the canal, it was not accepted knowledge that mosquitos are carriers of yellow fever and malaria. But an Army physician named William Gorgas had successfully fought these diseases in Cuba, and he came to Panama to do the same. Fortunately, the leaders of the canal project gave Gorgas carte blanche to solve the problem, and for the most part, he did. After the first few years, deaths from malaria and yellow fever fell dramatically. The canal was completed in 1914, and with only a couple modifications, the same canal is still in operation today—365 days a year. Fast forward to May 2018. It’s Pineapple’s turn to cruise through history! 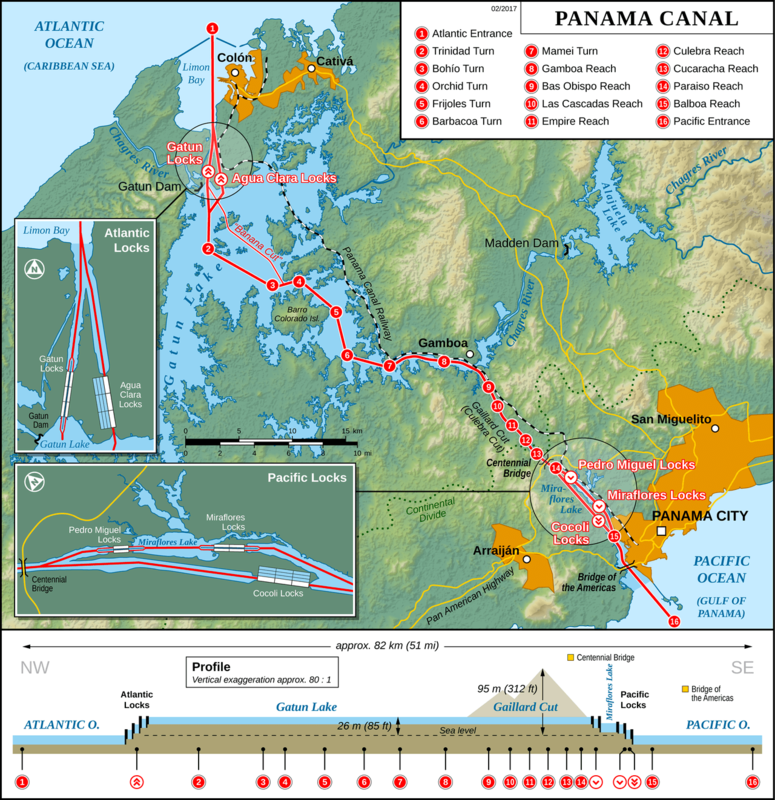 Planning for our canal transit officially began in Panama City. 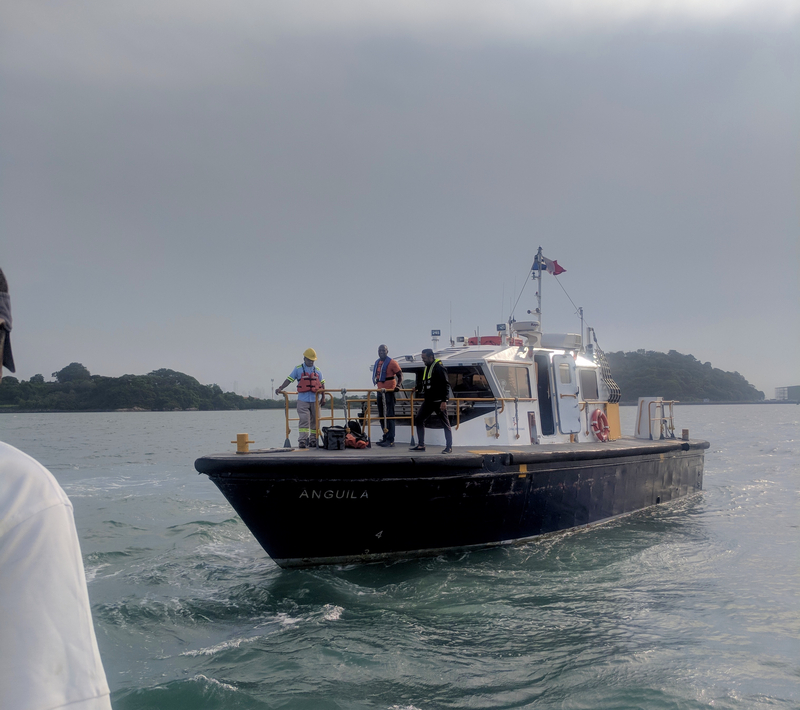 The day after we arrived, an “Admeasurer” from the ACP (Panama Canal Authority, or Autoridad del Canal de Panama in Spanish) came to the boat. The admeasurer… you guessed it, measured our boat, stretching a tape measure from the tip of the anchor to the end of the swim platform. He asked us dozens of questions about our boat, everything from the size of our tanks, to our maximum speed, to the number of toilets aboard. He filled in our answers on his iPad, then we signed a bunch of paperwork and he was gone after about an hour. The next step was scheduling. We requested a specific date, but as you can imagine, the canal authorities prioritize ships, which pay hundreds of thousands of dollars to pass through the canal. The schedulers do not confirm your date until the morning before. We’re not fans of last-minute planning, but we were prepared for it—we knew that flexibility would be key to this entire experience. With our preferred date approaching, we rented extra fenders and lines. There was a good chance we’d be tied to a tugboat or another sailboat while in the locks (more on that later), so we needed more substantial fenders than what we already had aboard. We rented ten old tires wrapped in plastic, which were delivered to the boat a couple days before our transit. The lines are used to hold the boat in position in the locks. They must be 3/4″ thick and 120 feet long—almost no cruising boats carry lines like those, so we rented. The morning before our transit, we received confirmation from our agent that we made the schedule. Yay! She told us to meet our advisor between buoys “2” and “4”—at the Pacific entrance to the canal—the next morning at 7am. Our agent said she thought it’d be a one-day transit, but that it was out of her control. For the next 24 hours (at least) our every move would be dictated by the ACP. 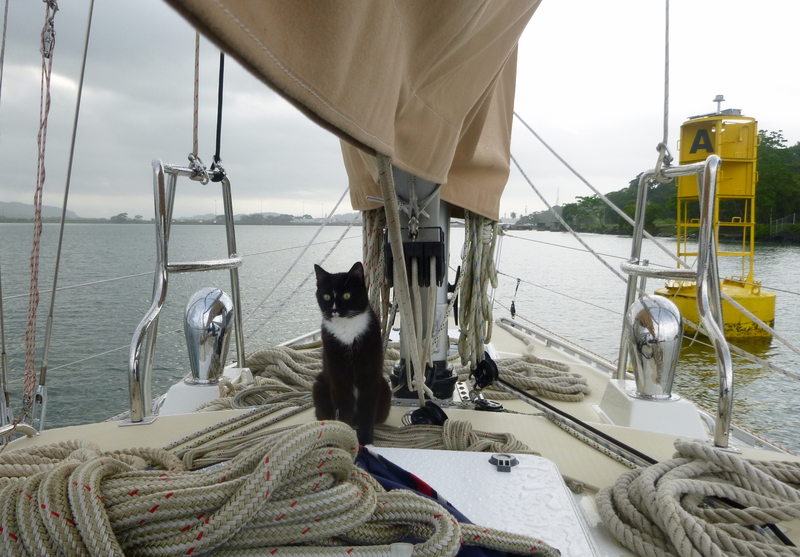 All boats must have a minimum crew of five: the skipper and four deckhands (called “line handlers” in canal parlance). 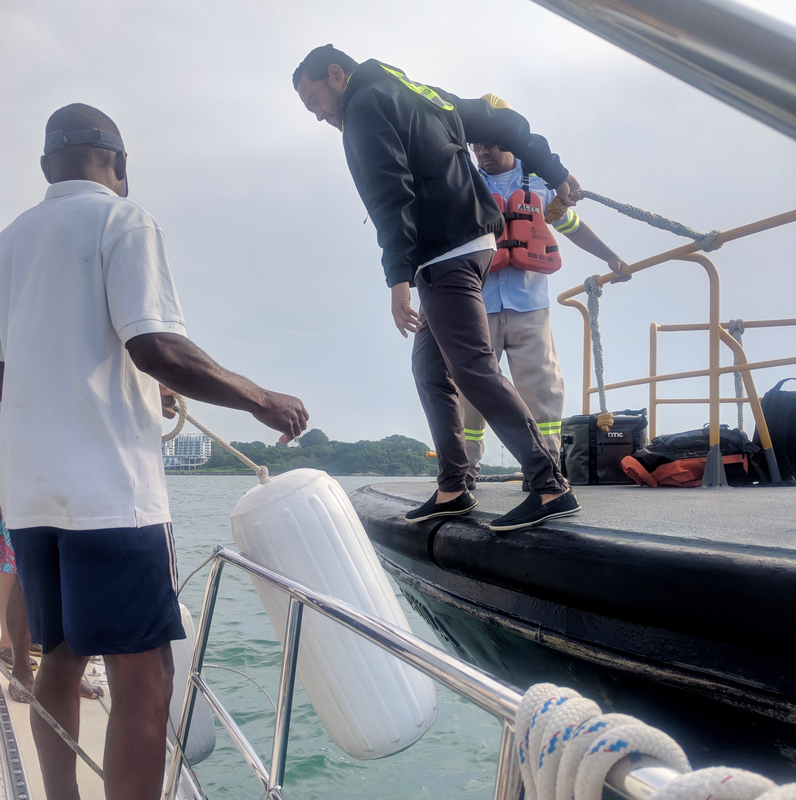 Our friend Holly (who cruises aboard L’Chaim with her husband and dog) joined us, and we hired two Panamanian professionals to round out the crew. One of them, Ricardo, had been our taxi driver in Panama City, so it was great to have another familiar face aboard. His first transit was sometime in the 80s, so he’s a seasoned pro. Around 6:30am we hailed the signal station at the Pacific entrance to the canal. John reported that Pineapple was in position and ready for our advisor. (Boats under 65 feet are required to have an ACP advisor aboard. Larger boats take a pilot, who assumes control of the vessel.) At 7:45am a pilot boat delivered our advisor, also named Ricardo, along with an advisor-in-training named Gustavo. 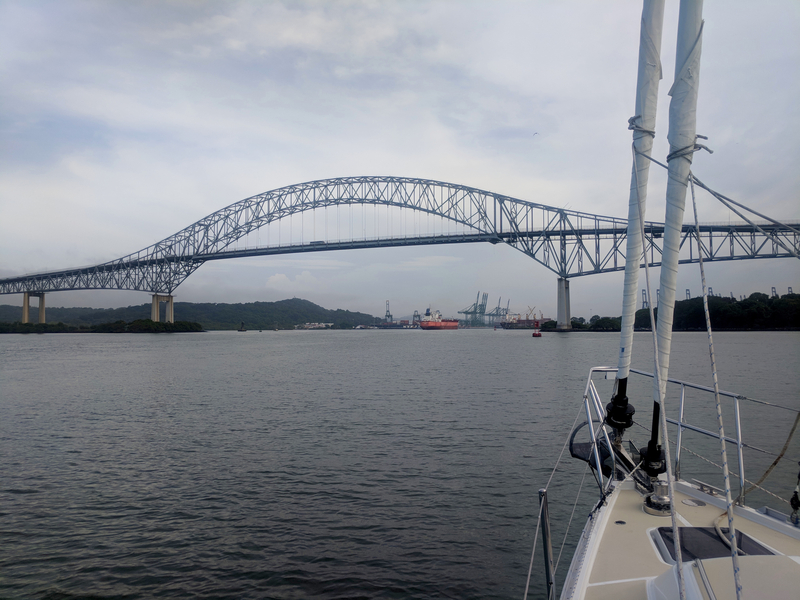 Once our advisors were on board, we were off, under the Bridge of the Americas and into the Panama Canal! 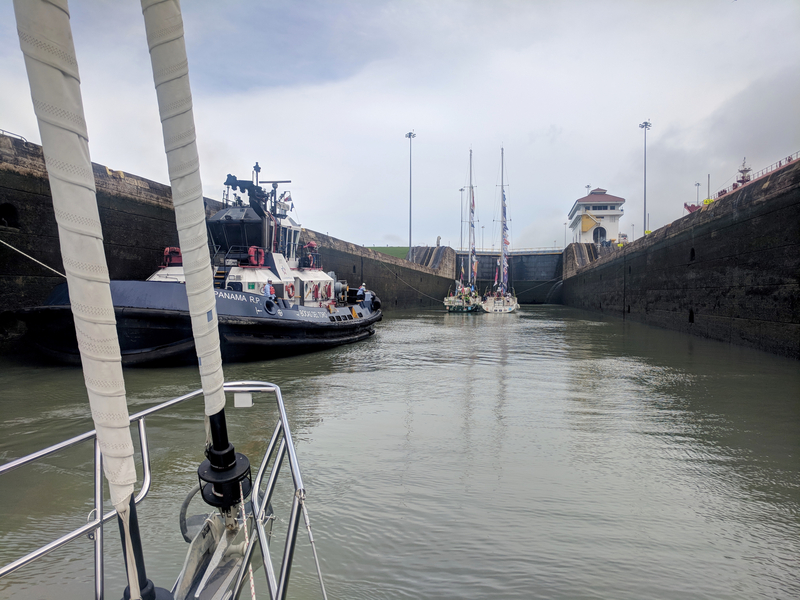 We needed to reach the first set of locks (Miraflores and Pedro Miguel) by 9am, where we’d be lifted about 85 feet from sea level. 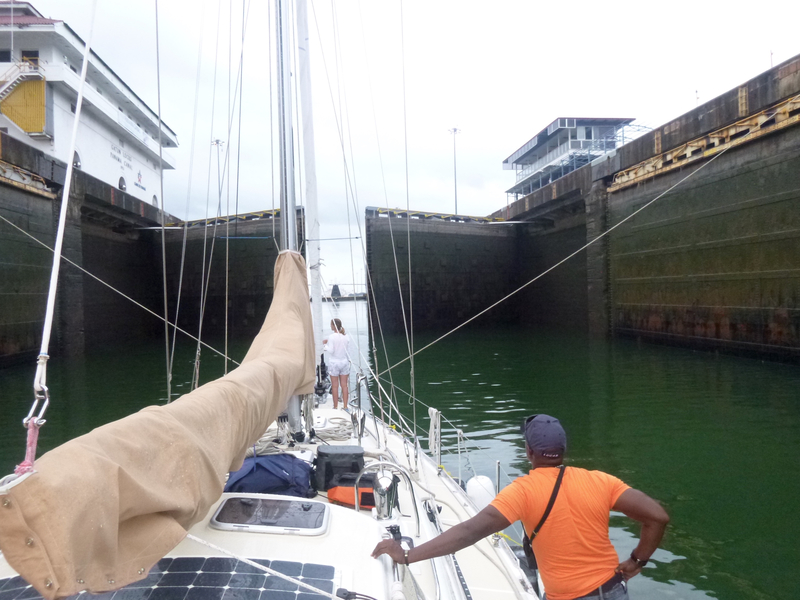 Once through, we would motor across the Isthmus, about 28 miles, to arrive at the Gatun Locks at the other end. Those locks would lower us back down to sea level and open into the Caribbean. If everything goes according to plan, the transit takes about 12 hours in a small boat. 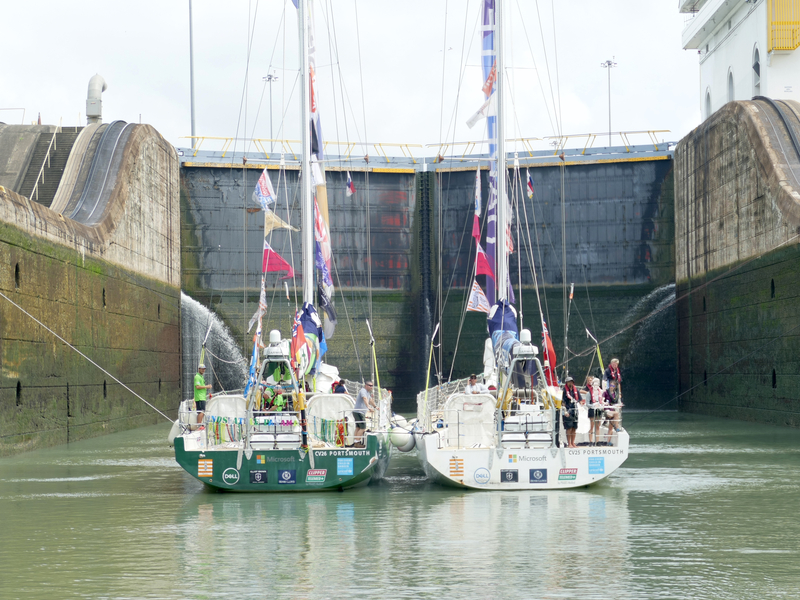 As we approached the first lock, we saw we’d be going through with two of the Clipper Round the World race boats. They entered the lock first, tied together, and then Pineapple entered and tied to the side of this canal tugboat. Between our line handlers, extra advisor, the tugboat crew, and John’s capable driving, tying up to the tugboat was uneventful. Finally, the tug arrived, the lock gates closed, and the water began to flow in. We watched the water swirl and gather into pools, rising from the floor of the locks, and within about 15 minutes, the basin was full. The gates on the other end opened and we moved on. The second and third locks went much faster. We finally left the first locks around 1pm. As we made our way through the isthmus, our advisor told us what we had already begun to assume: We probably weren’t going to make it in one day. He explained that northbound boats (when you transit the canal from Pacific to Caribbean, you’re actually going north; weird right?) typically need to enter the Gatun Locks by 3:30pm to make it through before dark. By this time, it was almost 2pm, and we had more than 20 miles to go—there was no way we could make it in time. 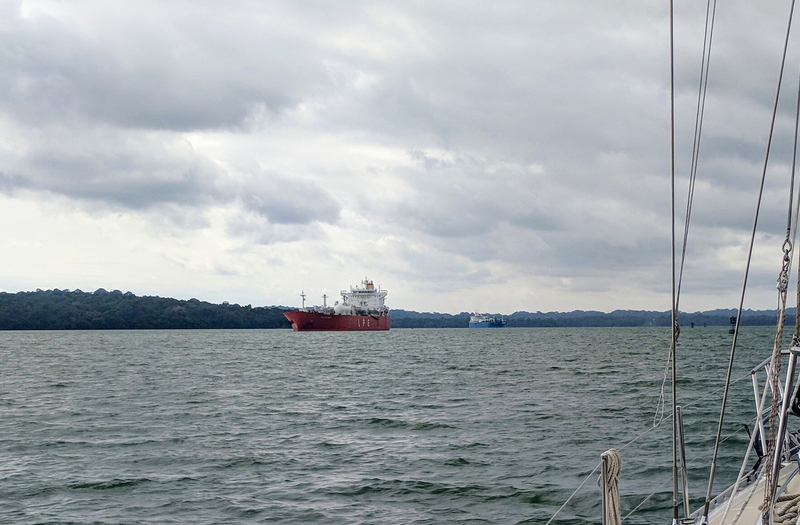 A two-day transit would require us to spend the night moored in Lake Gatun, which is the giant man-made lake that forms the middle part of the canal and provides all of the freshwater for the locks (as well as Panama’s tap water). 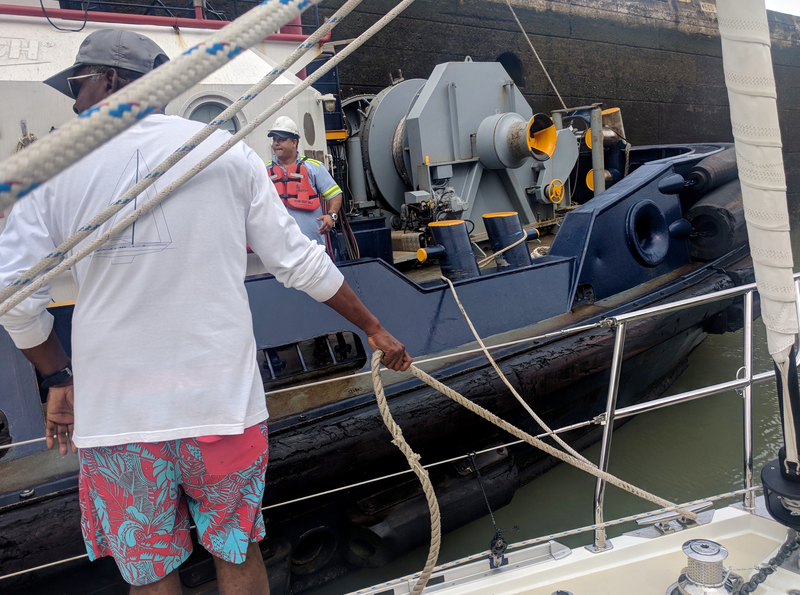 The Canal Authority runs northbound vessels through the Gatun Locks (on the Caribbean side) in the afternoon, so two-day boats have to sit most of the day, waiting their turn to complete the locks and pop out the other side. Between the excitement of the transit, the early morning, and a long day preparing the day before, we were exhausted. I did not have the energy to properly feed and entertain three guests. Extending the transit by 24 hours—since we’d likely wait in Lake Gatun until the following afternoon—was, honestly, a bit of a buzz kill. We wanted to keep the momentum going! We let the disappointment sink it as we chugged along the length of the canal. 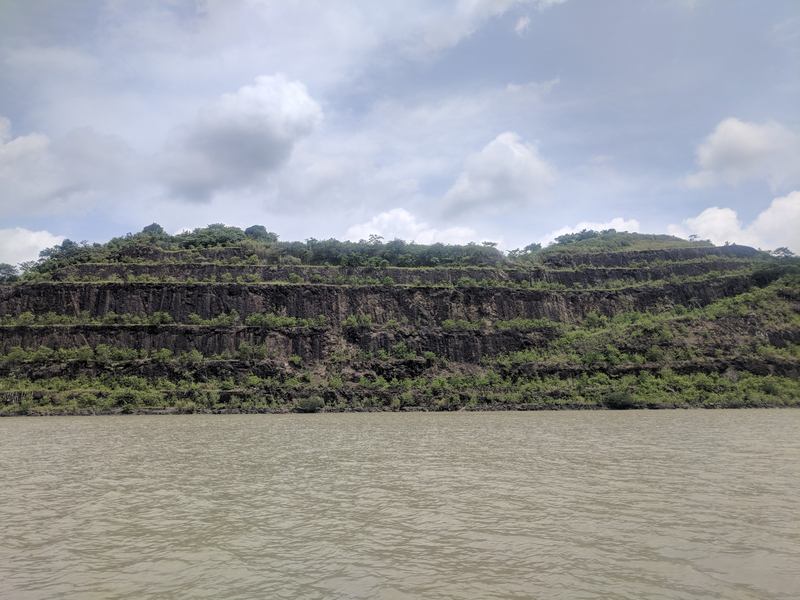 But it didn’t get us down—we were still in the Panama Canal (!) and the surroundings were epic. We looked up in awe at the terraced Gaillard Cut, which had been set back by landslide after landslide during construction. 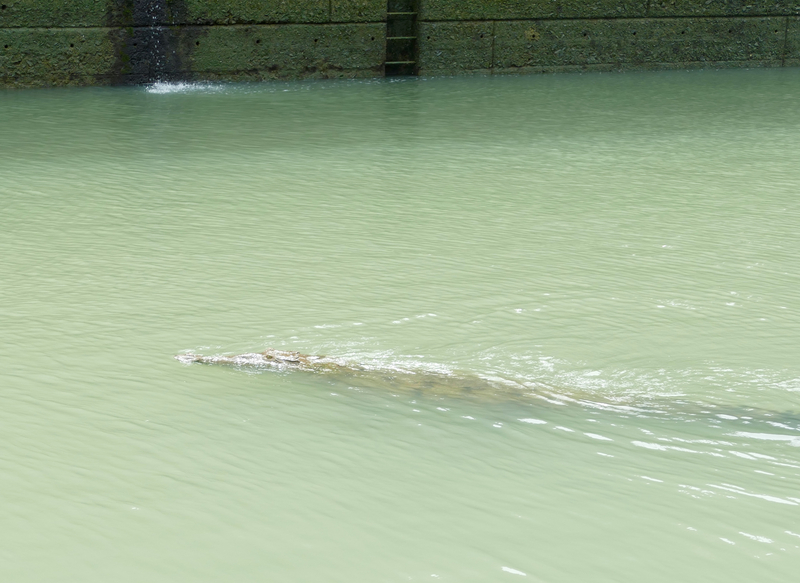 We peaked around jungley corners and watched for crocodiles as we followed the marked path through Lake Gatun. After a couple hours, the quiet channel became a nautical superhighway, with massive ships passing every few minutes. Both advisors brought their own VHF radios, and that’s how Pineapple stayed in contact with the canal traffic controllers. Chatter was mostly in Spanish, so we just awaited their direction at each step. After we’d been motoring for a couple hours, we heard the usual Spanish voices through the radio. John increased the throttle and we all crossed our fingers! As we approached the final set of locks, our advisor told us we could enter at 6pm. We’d have to navigate from the canal exit to our marina in the dark, but it’d be a one-day transit after all! 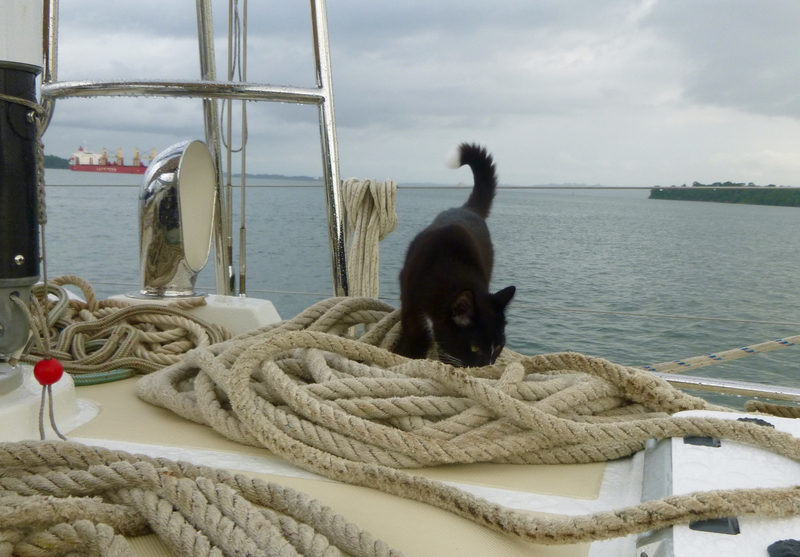 We tied Pineapple to a buoy and waited with the Clipper race boats. It started raining, but we didn’t mind—we were just so excited to be back on track. 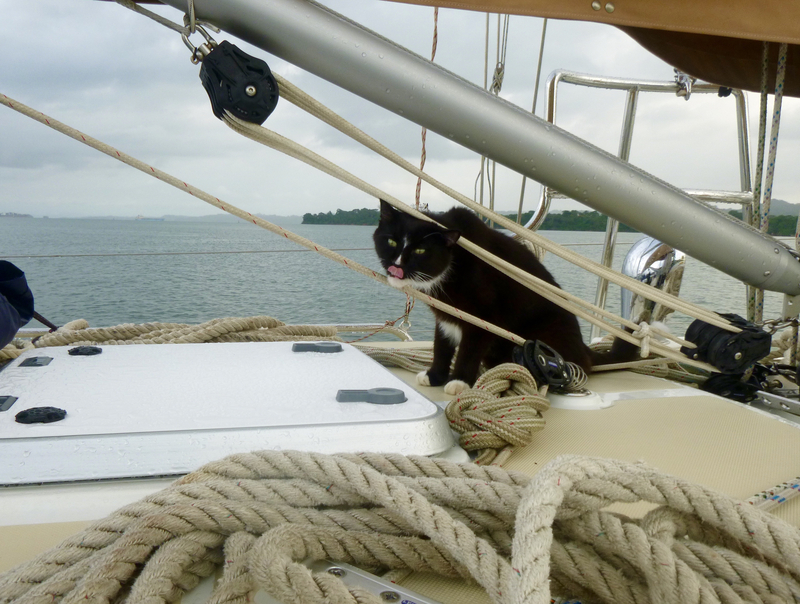 While we waited, we had snacks and laughed at Chase as he explored on deck. We watched a ship come around the bend a few miles back and assumed we’d go through the locks with him. (The Canal Authority typically squeezes sailboats through the locks with the money-making ships.) But the ship proceeded into the new locks (completed in 2016), leaving us and the two Clipper boats to enter the old locks alone! 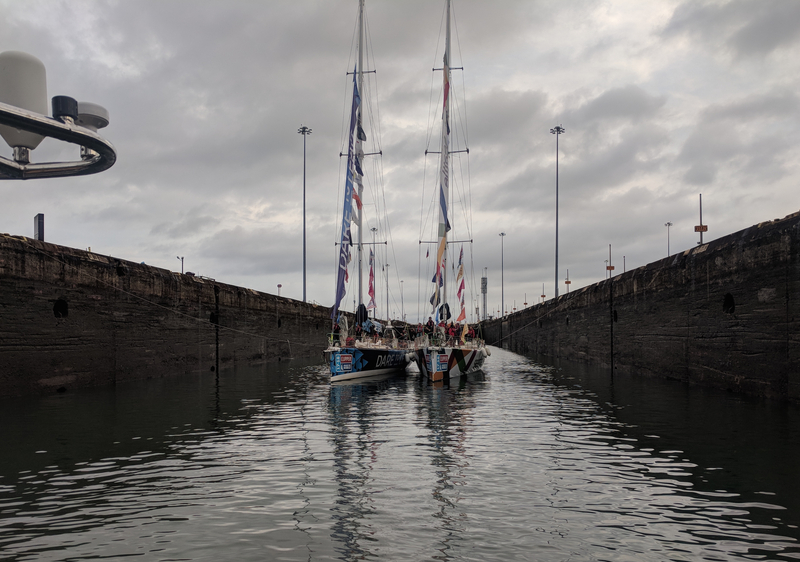 The race boats were rafted together and we were tied “center chamber”, positioned in the locks with four long mooring lines running to the walls. It was a totally unique experience: the canal virtually never operates the locks for sailboats only, and we were going through “after hours,” well past the deadline given by our advisor. By the time the final lock door opened and we motored away, it was completely dark. A pilot boat came to collect our advisors a few minutes later, and by 8:30pm were were safely tied to the dock—a dock in the Caribbean! There’s no way to know what happened behind the scenes, but we’re pretty sure someone pulled rank to get us all through in one day. The Clipper fleet was scheduled to begin the next leg of their race the following morning, so maybe we have them to thank? 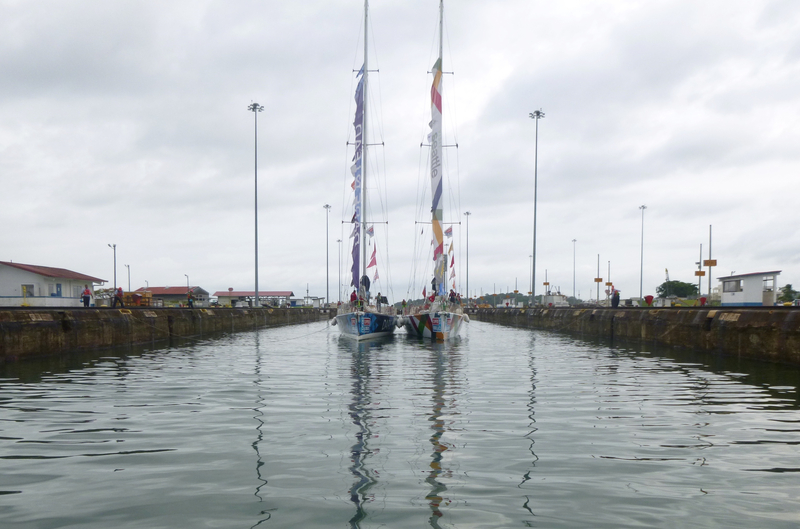 But in chatting with the race crews at the marina, we learned that they expected to spend the night in Lake Gatun too! Maybe it was the pilots aboard the larger Clipper race boats, who have more clout than small-boat advisors? Or maybe it was our advisor Ricardo, who’s also a senior training officer for the ACP—he knew everyone along the canal route and was not pleased at our delay in the first lock that morning. Either way, we made it and we were thrilled for a smooth transit! 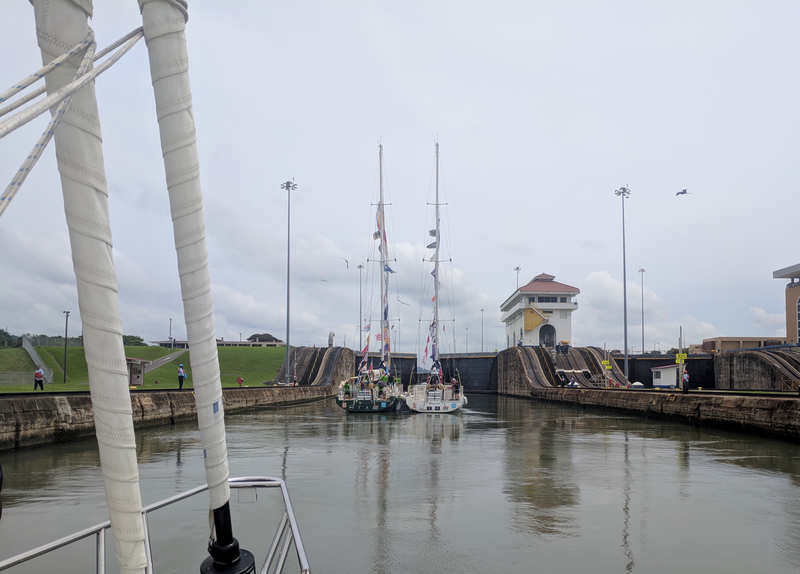 Taking Pineapple through the Panama Canal was so different from our other cruising experiences, but in a way, it felt like a natural continuation of everything we’ve been doing for the last 10 months. It was a grand finale. The realization of a goal. And an immense relief to complete our first season of cruising with so few issues and so many amazing memories. We are now in a slip at Shelter Bay Marina, just on the Caribbean side of the canal. Our days are filled with projects and chores—we’re working through a list of about 100 items in preparation to leave Pineapple here for a few months. As we plug away at our list, you can bet we’re revisiting our cruising memories daily: The dolphins swimming in our bow wake. The amazing new friends we’ve met. The five countries we’ve visited and the surprising experiences in each one. The beaches! The whales! Wow, you guys! What an adventure! I love reading all about your adventures and sailing vicariously with you. I hope we will get to see you while you are stateside! Congratulations! You both are so generous in what you share! The openness re financial issues/planning is helpful to many, sailers or others. Really enjoy every blog and appreciate all the helpful information. Thanks! John and Michelle so glad all is going so well for you guys, it seems that this was your destiny. I love reading your blog. Keep the pawticulars coming!